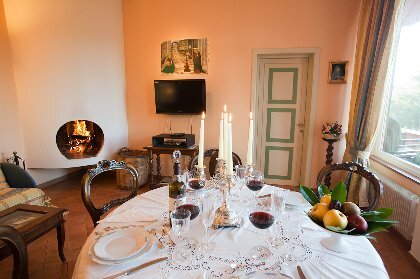 We believe that we are offering something that has been missing in central Italy: not your average farm holiday accommodation, nor an uninspiring flat, but a luxurious apartment in a villa in which the owners themselves reside, amid elegance, comfort and tradition, and accompanied by warm, friendly, family hospitality. 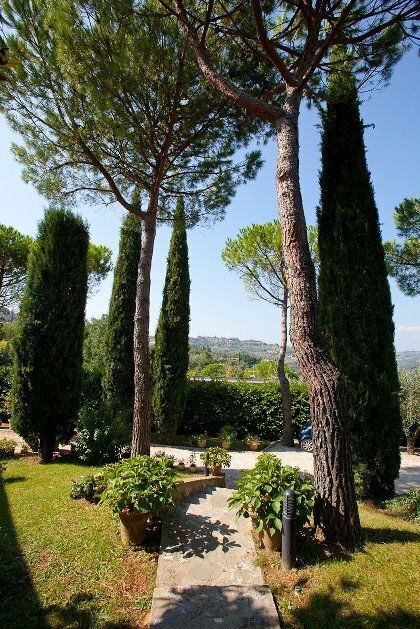 VILLA NUBA is the perfect location for exploring first-hand not only the marvels of the Umbrian city of Perugia, but also the many delightful Umbrian and Tuscan hill towns such as Assisi, Cortona, Gubbio and Todi. So many incredible places are just a close drive away! Contact us - We look forward to meeting you! A new and charming swimming pool with a hot shower, sun beds and chairs, ping pong table, parking inside the property and between the olive trees, the owners and... the fascinating sightseeing! Our stay in Villa Nuba was fantastic and contributed to a true Umbrian experience. Our expectations were high based upon other reviews and the website but even these were exceeded! A great balance of local charm with excellent facilities - made all the better by the excellent friendly service provided by Giuseppe for whom nothing was too much trouble. Well positioned on the edge of Perugia. We travelled with our 2 year old daughter and the apartment was ideal but equally it would suit families with older children or a group of friends travelling together. Very highly recommended. 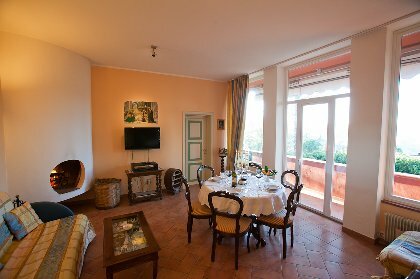 We (three adults who don’t speak Italian) stayed in Villa Nuba’s Pinturicchio apartment for five weeks (mid-February – late March) and enjoyed our visit very much! 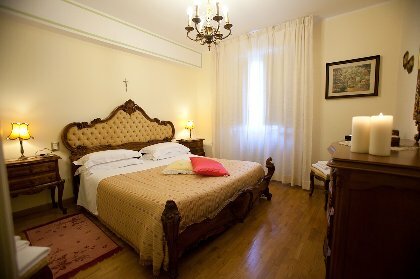 The apartment was comfortable and nicely furnished, the view was beautiful and it was easy to walk into Perugia or catch a bus or train to nearby towns in Umbria and Tuscany. Giuseppe was a great host who stopped by regularly to be sure everything was perfect (it was! ), answered our questions and provided advice on the best restaurants, shops and places to see. We shopped for local specialties like fresh pasta and vegetables and prepared them in the apartment’s well equipped kitchen. We used our fireplace nearly every night and we all loved the deep bathtub. Since the water is heated on demand, you never run out of hot water! Since I needed to work while we were there, I used the high speed internet connection - that worked out nicely. The weather in Italy in winter can be chilly but we were glad we went then – there were very few tourists. We recommend Villa Nuba and plan to return! I spent a fantastic holiday in Italy with my family this August. We decided to stay in Perugia for five days because the position of the city is perfect to visit Tuscany and Umbria alike. We had a great time at Villa Nuba where Giuseppe Nuzzaci our host was welcoming us. He is a friendly, kind and funny young Italian who gave us many ideas what to see and where to eat. Giuseppe tried the famous Hungarian hot paprika sausages with us on the first night, that made a perfect match with the Italian Grappa… The Pinturicchio Apartment was as charming as described at the villa’s website and we had a great time there. We were cokking yummy dinners in the fully equipped kitchen and even though the weather did not permit a swim in the nice pool, our children tried the jacuzzi one night… It was good all of us could check the most important e-mails in the internet room. We devoted our first day to Perugia, then visited Gubbio, Arezzo, Siena and Cortona. Our guide book was the favourite Hungarian book of the family, Antal Szerb's Journey by Moonlight. In the book written in the 30s. The childhood friend of the protagonist became a monk in Gubbio in the monastery up on the hill, attached to the Basilica of St. Ubaldo. Thanks to Giuseppe we took the Funivia (cable car) to go up to the basilica, from where we so the most amazing view of the city and the scenery around. After 35 years we also went back to Arezzo, a dear town for us. In 1972 our Hungarian choir participated in the Concorso Polifonico and won two prizes in Arezzo. It was an exceptional feeling to show the places where we had sang decades earlier to our children. We went up to Venice for two days from Perugia to finish a wonderful holiday. Just a quick note to thank you for making our stay at Villa Nuba so enjoyable. The apartment was absolutely perfect, and Bruno thinks the pool was one of the two coolest things about the holiday - the other being the Gubbio funivia. We'll be back, I'm sure. Spent a perfect week at Villa Nuba in July when Italy was experiencing record temperatures and the pool was therefore an essential. Giuseppe made our holiday special, being the perfect Italian host. He greeted us on arrival, took us on a tour of the local supermarket, pizzeria and city walls and gave us some top tips about what to do/not to do. I was worried that with two teenage children (aged 16 and 14) there would not be enough to do but with the trip to the last night of the Umbrian Jazz Festival, the venicular cable cars in Gubbio, the boat trip across Lago Trasimeno, the day trip by train to Florence and of course the retail therapy in Perugia itself, they were well entertained and had a fabulous time. The apartment was ideal with good facilities and very clean. We would definitely recommend it to any one. Both my husband and I just wanted to report on our wonderful visit to Villa Nuba. We stayed in the Del Perugino apartment for the month of June and it really was a home away from home. 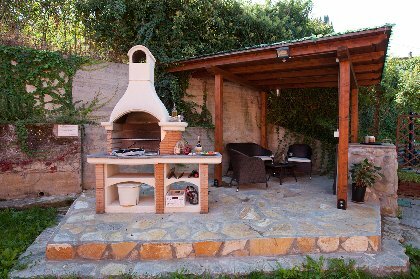 The location was perfect - a countryside setting just a short walk from the centre of Perugia, and in close proximity to the many hill towns in Umbria. The apartments are really luxurious and every amenity has been thought of. Guiseppe and his parents are wonderful hosts and were very helpful in all aspects of our stay. We may be back! Spent 2 weeks at Villa Nuba from 1st June 2007 and loved every minute. 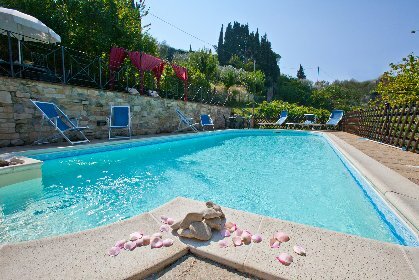 lovely position, quality fittings etc,nice pool,a host who will do anything to make the stay relaxing and fun.Ideal position for seeing the surrounding sites such as Assisi but we loved Spello- a must visit town. Myself and 3 sisters(seniors) just returned from 1 week at this apartment and it is hard to do justice to this place with words. 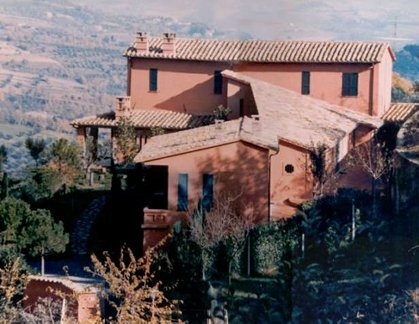 The location was beautiful being situated on a hill overlooking all the beautiful Umbrian countryside but it is only 15 minutes walking distance from the centre of Perugia. The villa is a converted 1400's farmhouse and there are 3 separate apartments all luxuriously finished and furnished with wonderful antiques. 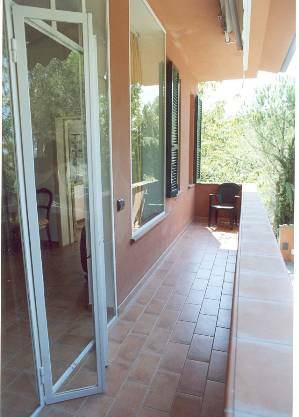 It is spotlessly clean, has a wonderful new swimming pool and you have the use of a computer in a separate room. The thing that really impressed us was the hospitality of the host, Guiseppe and his lovely parents. Nothing was too much trouble and it absolutely made our trip. I would not hesitate to recommend del Pinturicchio to anyone - utterly fantastic. We send you our greetings from USA and our home in Colorado.We truly enjoyed our stay at Villa Nuba; you were a great host to us! Thank you for your concern and care. I am enclosing a picture for your website of my wife, Liz and I. By the way, we did enjoy sunshine at our stay in Bellagio on Lake Como. I think you told Liz that you would give us a free week stay if that happened right? :-) I left some underwear at our apartment. You can just keep it until we return. We wish you success, full occupancy and good health!